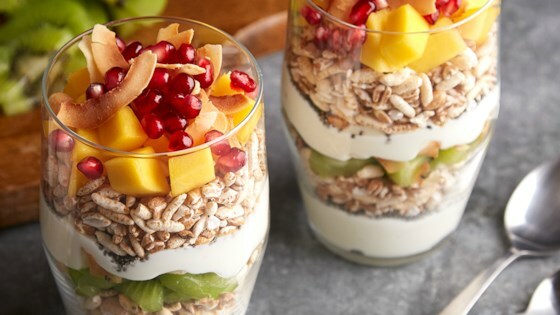 "Layers of a creamy vanilla mixture, chia seeds, puffed cereal, kiwi, coconut, pomegranate seeds, and mango make a quick and delicious dessert or snack." In a small bowl stir together yogurt and Carnation Breakfast Essentials(R) Classic French Vanilla Powdered Drink Mix until combined. In a pint glass spoon half of the yogurt mixture. Top with half of the chia seeds, half of the cereal, the kiwi, and half of the coconut. Repeat layers, with half of the yogurt mixture, chia seeds, and cereal. Finish layering with the mango, remaining half of the coconut, and pomegranate seeds. I used cranberries instead.I think this it's much better.I used a rum sauce and it came out incredible! !